Several years ago, shortly after I was let go from Talyst, I found myself with some free time on my hands. I started writing a book. The book was titled ‘Making the right choice: Helping pharmacies make smart decisions about automation and technology’. Like many books I’ve started, it remains unfinished. I don’t think I’ve touched it since 2016. At least that’s the date I have listed as the last time I edited it. However, I recently had reason to go back and review some things I included in the book. Kind of a retrospective review of advice to myself. 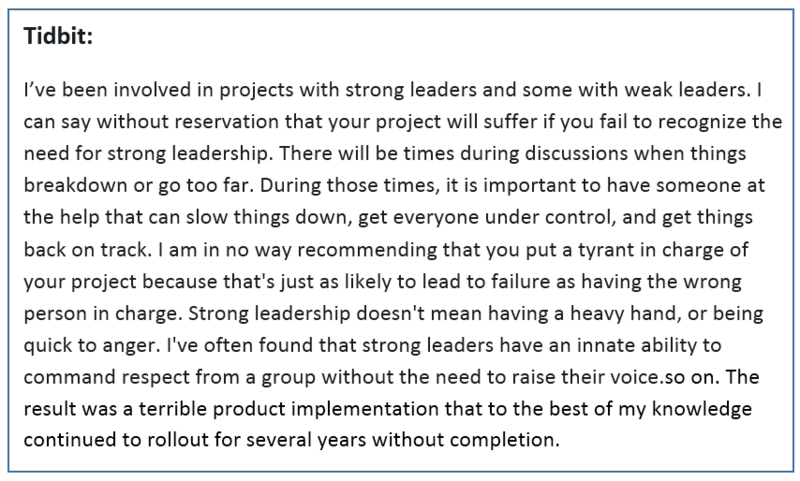 Specifically, I was interested in my thoughts on putting together a project team and managing a project. And there, in Chapter 8: First things first, I found what I was looking for. Some of the information is outdated, specifically the final page called Cautionary Tale**, but overall the information still rings true. Here it is, Chapter 8 in it’s draft form. Maybe one day I’ll get around to finishing the book. One never can tell. You can’t get to the end of a project if you never start, and getting started can often seem like the most difficult part of any project. I can’t pinpoint why it’s so hard to get started, but it is. Perhaps it’s fear of the unknown, or unwillingness to move away from comfort zones. Or maybe it’s because we don’t want to do the work. Who knows? The only thing I know for sure is that once the ball gets rolling, no matter how slowly, it always seems to roll forward. The key is to stop putting it off and get started. With that said, it’s important that one is truly ready to move forward. Understanding the reason(s) for doing something is key. Seems simple, but it might surprise you to learn how often people do things without understanding why. Begin the process with eyes wide open. Never do anything simply for the sake of doing something. One must be able to justify all projects, regardless of their purpose. Simply put, the project must worthwhile, viable and affordable, bring a reasonable return on investment (ROI), and be within acceptable tolerances and risks. Does the technology make sense? If you’ve answered the above questions to everyone’s satisfaction, it’s time to get busy. Below are the things that I think are important to ensuring a successful technology implementation in a pharmacy. While it may seem like a lot of work, the end result will be worth the time and energy. Gauge user beliefs and feeling. Is it going to be an uphill battle? Are the pharmacists and technicians open to the idea of implementing new technology? Is the pharmacy morale where it should be? Does your department fear change? The success of your implementation will rely heavily on how well you and your department are prepared. The implementation of new technology can often pose a threat of reduced control over one’s work. This can create pushback from the staff. Helping them understand what it is you hope to accomplish, how it will help them, and offering opportunities for staff to become involved and have a vested interest in the project can go a long way to ensuring a successful implementation. Get support / buy-in for the project. The need for support for any project is a must, and this is especially true for pharmacy projects. Success depends on support from the top of the organization to the bottom. Lack of support will result in a failure to launch. If and when possible, it is best to start with an executive sponsor, or someone from the Hospital Board of Directors, if you have one. This person, or persons, will be your champion during high-level meetings within the organization. Once you have executive level support, it’s time to consider support from other areas. If the project will impact nurses, find a nurse. If a physician, find a physician. And, so on. You don’t want to launch a project that will impact a group of people without getting their support. Trust me, it’s not a good idea. Call it politics if you must, but peer-to-peer communication works wonders. Having support from a variety of areas and disciplines will improve communication and go a long way in generating support for a project. Create a buzz. Create some excitement. Don’t act like the project is required, but rather a choice that’s going to make things better. Give everyone fair warning of what you plan to do. People fear change. Give them plenty of time to get used to the idea. This will go a long way in gaining support for a project. Being aware of what’s coming is always preferable to being surprised by what has already been done. Involvement and participation. When individuals believe that a project is relevant, they are much more likely to have a positive attitude toward it. And the best way to get individuals to believe is to get them involved. Allow them to participate in all phases of the project. “Increasing user participation … enhances post-development user involvement and attitude” (Vaughan PJ. System implementation success factors; it’s not just the technology. Internal Report of Information Technology Services. University of Colorado at Boulder. 2000), which is what you want. Involve as many as you can as often as often as you can. When people are involved, it gives them a sense of ownership and a vested interest in making a project successful. It also helps deal with negative vibes from others. Include multiple disciplines, depending on the technology and departments affected. Champions. Champions are those people that go above and beyond the general participant. Champions believe in the project and the benefits it will provide. They can often have a contagious zeal about the project, and are sometimes referred to as “evangelists”, or in extreme cases “zealots”. Whatever you call them, when it comes to implementing new technology in the pharmacy, Champions can be your best source of support. They can be useful in putting a spotlight on the project in a positive way and swaying the negative feelings of others. Finding Champions shouldn’t be too difficult. They’re usually early adopters and will take the initiative to learn more about a project without being asked. Be willing to commit to handling extra work, even if it means staying late or doing some reading at home in the evenings or on weekends. I understand that no one wants to put in a bunch of unpaid overtime on these projects. However, on occasion, a little extra work may need to be done to keep things moving forward. One should enter into participation with the understanding that this could happen. Be willing be engage in every aspect of the project, not only the items that are assigned. It is vitally important that each participant have at least a basic understanding of the overall scope of the project and what each member of the team is assigned. Things happen. People get sick, quit their jobs, move to another state, and so on. Unforeseen events should not completely derail the project timeline or goals. Find naysayers and sway them over to your side. Every project has its opposition. As the saying goes, you can’t please everyone all the time. Unfortunately, naysayers tend to have vocal personalities. They’re not afraid to say what’s on their mind. These two things – being negative and outspoken – tend to go hand-in-hand. The downside to naysayers is that outwardly negative comments about a project have a way of spreading like wildfire. They can be caustic, seeping into the minds of even the staunchest supporter. And once there, negative thoughts can grow like a cancer. With that said, naysayers and their negative comments have their place. Because they’re not afraid to speak up, they can sometimes point out things that others fail to see, helping avoid potential pitfalls. The trick is to use the information to your advantage. Allow naysayers to offer up their thoughts in a controlled environment where their comments can be contained. Give them space to vent. Listen to what they have to say. Use what you can and toss the rest. Showing naysayers that you’re willing to listen and take their concerns seriously can go a long way. In rare cases, you might even make a convert out of one, which would be a huge victory for the project. However, never try to force change on a naysayer. Forcing change, or mandating them to join your side, rarely works. It’s like dealing with a donkey, the harder you pull, the harder they resist. Build your team. According to Harvard Business Review’s (HBR’s) 10 Must Reads On Emotional Intelligence[(HBR’s 10 Must Reads On Emotional Intelligence. Print. ), a source of great team success lies with teams that can achieve high levels of participation, cooperation, and collaboration among members. Sounds logical, but oh so difficult to do. Note: HBR’s 10 Must Reads On Emotional Intelligence is a great collection of previously written articles pulled together into a single book. Each article is informative and interesting in its own right. However, when combined, they create a great collection that any person involved in a project should read. I highly recommend it. It’s a short book and an easy read. Have a sense of group efficiency: belief that the team can perform well and that the group is better than the individual members. Collectively, HBR refers to this as the groups “emotional intelligence” (EI). While intelligence and experience among group members is important, EI may be more important still. Keep that in mind when you begin building your project team. Chose a project leader. Ah, the leader. The captain. Thy person in charge. It’s a burden that many well qualified individuals shy away from. Someone has to be in charge. Someone has to be given authority over the group and be willing to make the tough decisions and hold people accountable. Not everyone is cut out to be a leader. Everyone reading this has worked for both great and terrible leaders. While I cannot tell you exactly how to identify a great leader, I know one when I see one. According to HBR’s 10 Must Reads On Emotional Intelligence what distinguishes good leaders from great ones is their EI. For individuals, EI is “a group of five skills that enable the best leaders to maximize their own and their followers’ performance”. Find yourself a project manager. 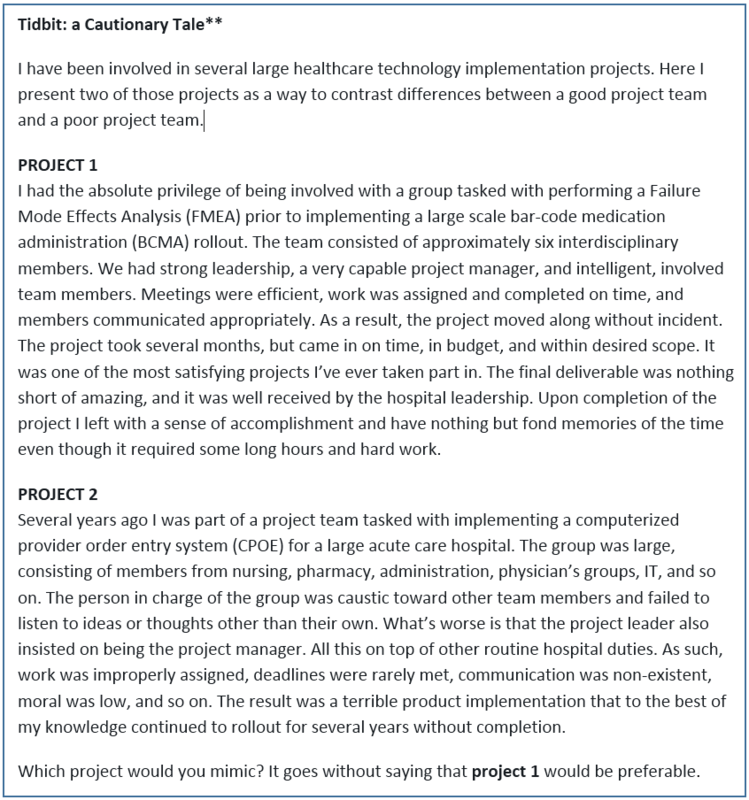 As ridiculous as this may sound, the project manager is an often overlooked position when discussing project teams. Let me go on record now as saying that a good project manager is absolutely vital to the success of any project, and could arguably be considered the linchpin to the success of the entire project. It is the job of the project manager to manage all aspects of the project, including the scope, timeline, cost, quality, and people. They apply their knowledge, skills, tools, and techniques to help projects be successful. The person must have leadership qualities, have good self-management and time management skills, and be a taskmaster. The project manager cannot serve two masters. Individuals that serve as a project manager must not be required to do any of the actual work in the project. According to James Lewis, “as team sizes increase, it becomes impossible to work and manage both [the work and the team], because you are constantly being pulled away from the work by the needs of your team members”. Having project managers attempt to manage the project and perform work in the project is a recipe for disaster. The person must have a proven track record. We all know people that can’t manage the paper piles in their office much less a multi-faceted project requiring meticulous attention to detail. I encourage everyone involved in a large project to read a book or two on project management. Being a project manager is not as easy as it sounds and should be given the respect it deserves. **Cautionary Tale. Since drafting this section of the book, I have been involved in another amazing project. One that had me working with large teams to remodel or construct new pharmacy cleanrooms for several hospitals. The project spanned well over a year and was simply incredible.